Yep, I’ve been spinning. I’ve been trying to make sure that I get in more time with the spindle on a regular basis. I hope that this will lead to improved yarn results. That’s part of the difference for me between spinning and knitting. 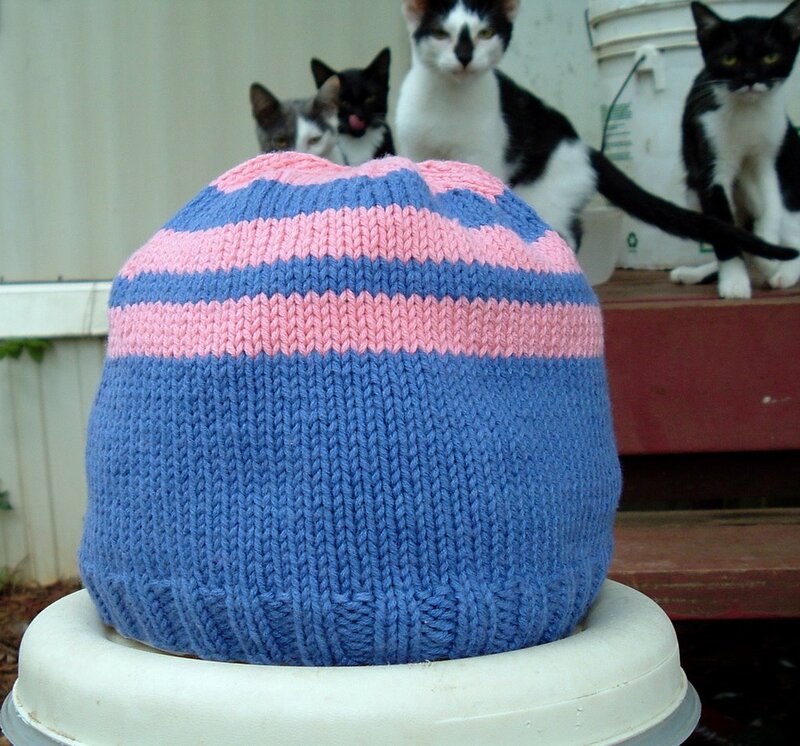 Even when I was a beginning knitter I was able to produce nice, useful, knitted objects. 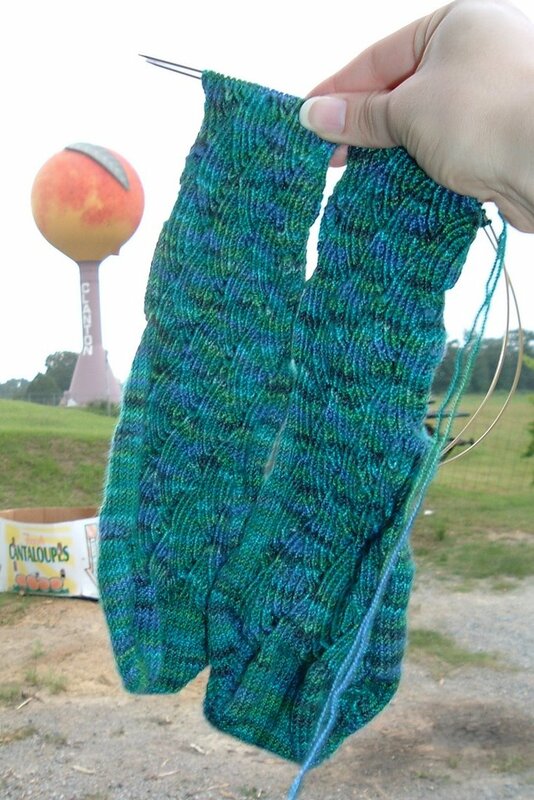 A brand new knitter’s very first stitches could result in a garter stitch scarf if carried on long enough. It is true that over the years I have improved and become able to create a greater variety of nicer and more complex garments and accessories, but I was always able to make something. Once I knew how to make a knit or purl stitch, I created knit and purl stitches. My spinning has been another thing altogether. What I have previously created has not resembled yarn. I feel wasteful that I’m using up fiber and not producing something good enough that I can use it to knit. I’ve made messes. I’ve gotten in touch with the drop portion of drop spindle. I’ve created tangles. Now, however, I am beginning to make yarn. 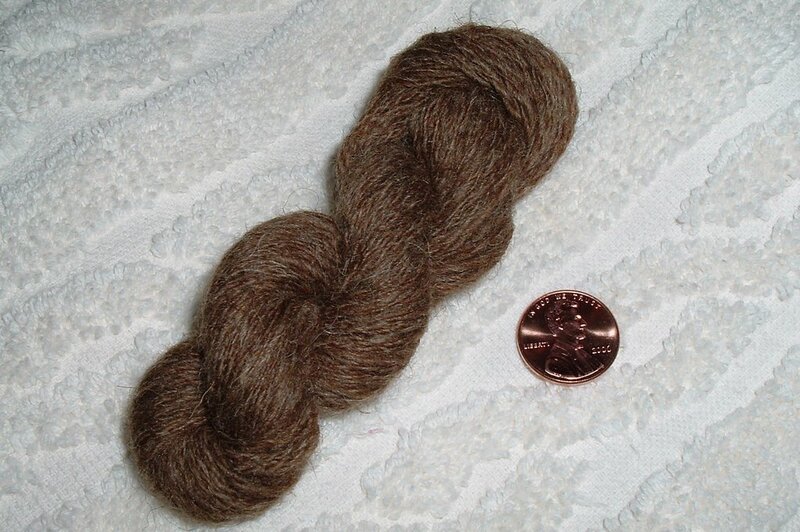 I know you can hardly wait to see my real-live, real-little, skein of handspun (penny included for scale). 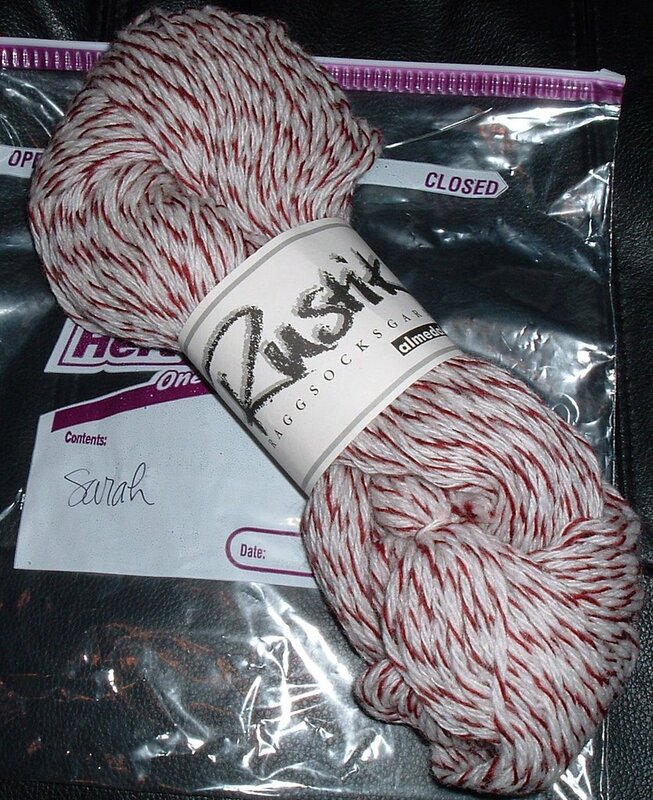 I may keep this little skein as a reminder of when I first created yarn. Then again, I might want to try and knit with it. What to try and knit with it is another question. I know that I have spun up 8 grams (1/4oz). What I don’t know is my yardage. Soon I will set my husband to constructing a niddy noddy for me. It’s not that I cannot make one myself, but he likes doing that sort of thing. He will probably have improvements to make on any set of directions I might provide. I plan to go the cheap-o PVC route for now. In the meantime, I’ve taken to spinning with the fiber my mom brought back for me from Estes Park Wool Market last year. She bought me the fiber, a nostepinne, and a spindle. 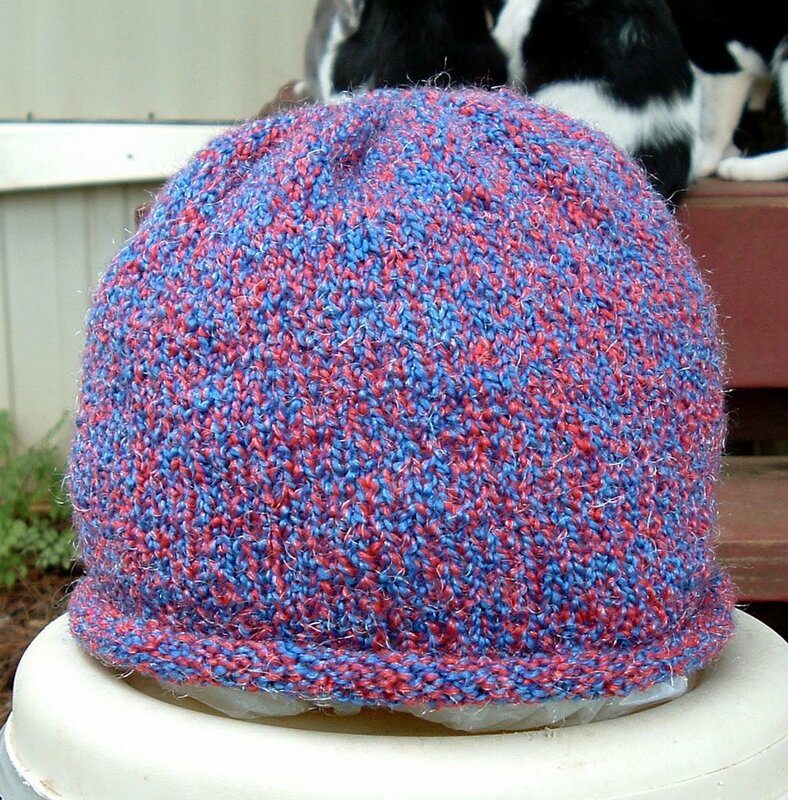 The fiber is Polypay Wool Top, and it has been dyed some really groovy greens and purples with plain bits, too. The nostepinne and spindle are from Magpie Woodworks (no website). 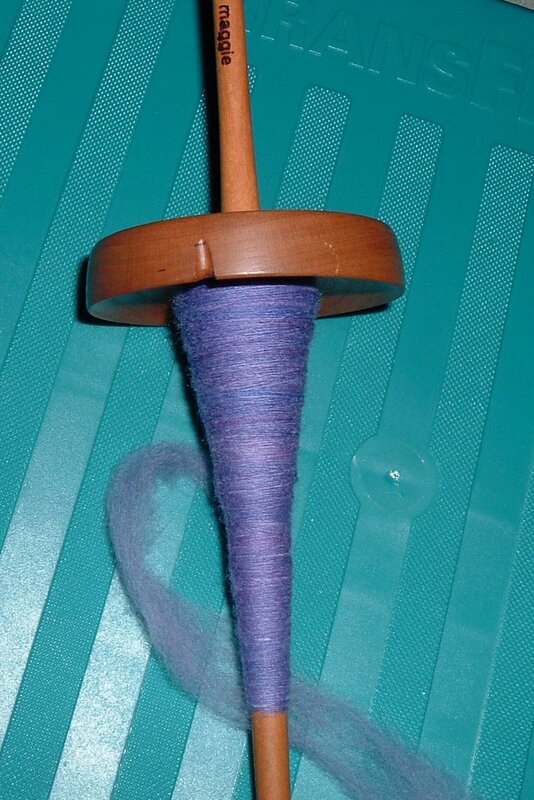 I never felt I spun well enough (and I never put in enough practice time) to do anything with the fiber. A couple of years ago I bought a kit with a Louet drop spindle and some fiber from Blue Goose Glen Farm at the Harvest Days and Fiber Festival at Cannonsburgh Village in Murfreesboro, Tennessee. The wool from the starter kit is what I’ve spun up for this first little skein. Anywho, I’m going to keep working at the spinning on as close to a daily basis as I can. I’m having fun with the colored roving. I see how it looks different as I spin it up, and wonder how it will look when it is plied. It’s an adventure. Speaking of adventures, a fiber acquisition opportunity approaches. The Monday Nighters have planned a trip here on Saturday. I might be able to join them. Sometimes good things can happen when you outsmart the map. Truth is, we didn't look at our directions until we thought we had reached the point in our journey when we would begin to need them. It turns out that Mapquest had planned for us to get off the road we were on much earlier. However, it we had followed those instructions, we would not have been able to take the exit to a nice fruit stand where I took a picture of the Pomatomus and Bruce bought a big basket of peaches. It has been called the knitalong to end all knitalongs. Okay, so I haven't read this description of the event anywhere, but I want to impress upon you the enormity of this happening. There were over 200 sign-ups in the first week. You still have plenty of time to join in on the fun (sign-up deadline is 8 September). I'm pretty excited about all of this. I've been telling everyone about it. My husband think it sounds nifty, too. When I wasn't sure about taking part in it, he was encouraging me to jump in and become a part of the madness. I'll need to clear the sock needles to get ready. 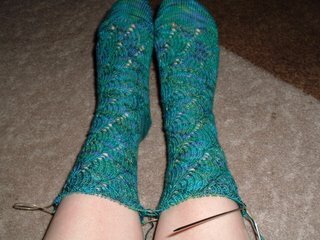 This will help me move my Pomatomus from the needles to my feet. I think this is going to be fun. I don't see myself winning, but that's not really the point. Still, the worst case scenario is a new pair of knitted socks. Yes, I know there are always possible flakes and other things that can happen, but I'm not too worried about it. I'm going to play by the rules and have fun playing this game. I almost stayed home. Then I saw the enthusiasm in the e-mails of others that would be there, and I decided to go. There was more gabbing than knitting that night. First it was double show and tell. JJ had returned from a business trip to California and brought back yarn for Jaspher. They generously gifted each of us with yarn. I got this extra groovy Cascade Pearls. Margaret’s Knitpicks order had arrived. She had a boatload of shade cards for us to view. That is so cool. I can’t tell all about the rest of her yarn because I want to wait for the finished object. Begin to prepare yourselves now. I don’t know when it will happen, but it is awesomely frightening for some, and frighteningly awesome for others. Eventually I did get the needles out and began to knit. I didn’t get but about three stitches in when I saw something was wrong. There was a problem with my Pomatomus that I could not reconcile (more on that later). I had already begun and completed one project that day. Don’t get too impressed. 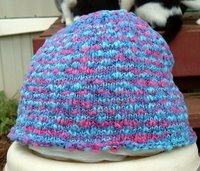 It was a sweatband made from worsted weight cotton. I shoved more of that yarn into my knitting bag before I headed out that night. It was a good thing that I did. Otherwise I would have been just sitting and not knitting. Sure, I had a ball of Royal Bamboo and the Ballet Camisole pattern, but I still couldn’t decide on the right size (details to follow on this, too). So, I pulled out some needles and that cotton, cast-on, and began knitting. They asked what my project was, and to answer I modeled the one I had made earlier that day. They got a good laugh. Do sweatbands improve the appearance of anyone? Not mine, nor anyone else’s I’ve seen. Still, they serve a function, and I’ve needed to knit more. I sweat when I exercise. I’ve been expanding my exercise repertoire, and to aid in this, I received another sweet prize. Margaret kindly gave me her old VHS copy of Buns of Steel Power Yoga. Her VCR is kaput, and since she doesn’t plan to get another, she passed this workout video on to me. I viewed it last night, and I know that it will challenge me. 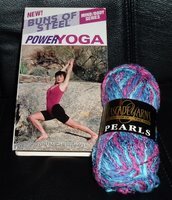 It is a great addition to my exercise video collection especially because I’ve needed more stretching. Of course it will also serve to strengthen and get my heart going. Monday Night Knitting is very dear to me. I’m thinking about something for them. I won’t write about it in case they stumble across the blog. They really do help me and my knitting. In fact, I think that it was the fact that I spent time with them that I was able to fix two knitting problems. One was the Pomatomus. Turns out I just needed to read some of the written directions to see what to do before working another repeat of the chart. Next, I figured out which size to knit on the Ballet Camisole. I was so focused on the chest measurement. Then I looked at the numbers on the schematic and the measurement at the bottom of the top let me know which size will be best. I’ve progressed a couple of rounds on the socks, and I’ve cast on and passed the ribbing on the camisole. I’m doing things and it is good. I was beginning to stall out a bit.